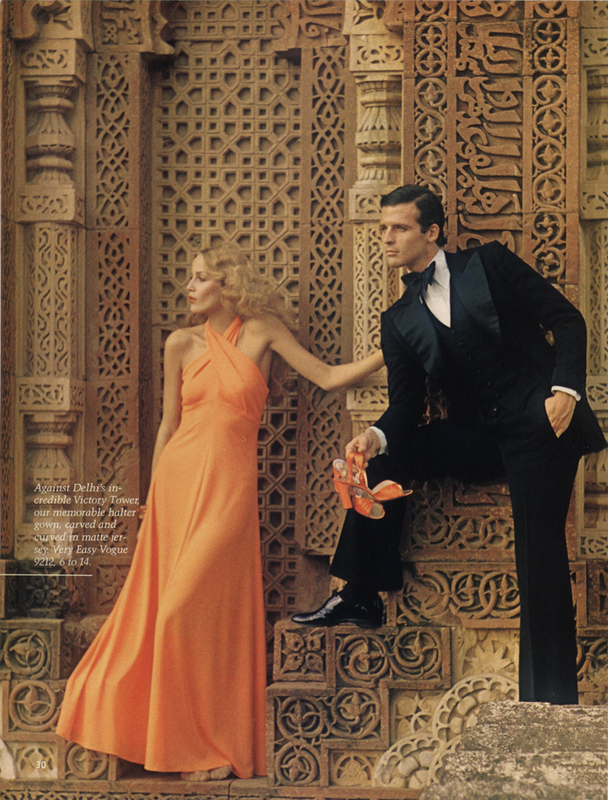 Everyone’s already seen the spread of Jerry Hall in India from the May/June 1975 issue of Vogue Patterns magazine, right? Maybe not, but even if you have I’ve got an interesting piece of info here that you may not have seen before. 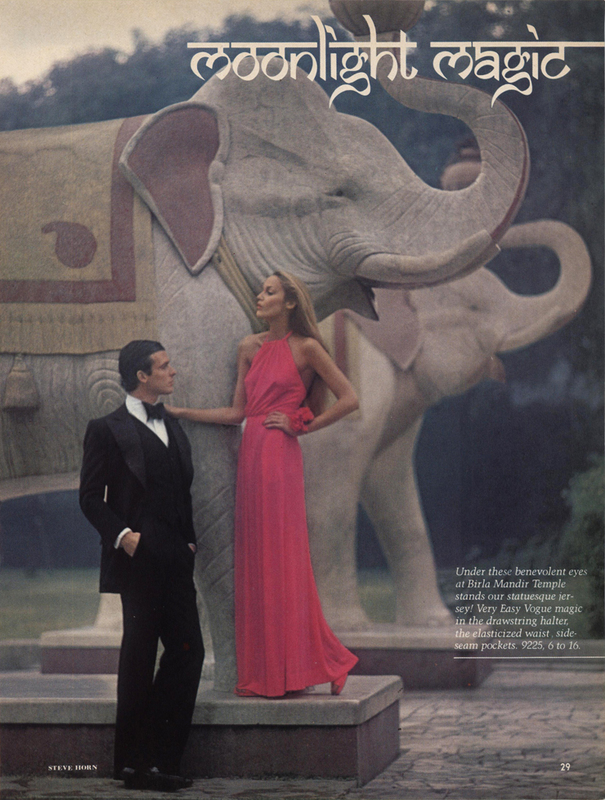 “During this time I went on a three-week trip to India with Vogue Patterns and photographer Steve Horn. We did some enchanting photos but the dresses were pretty awful! 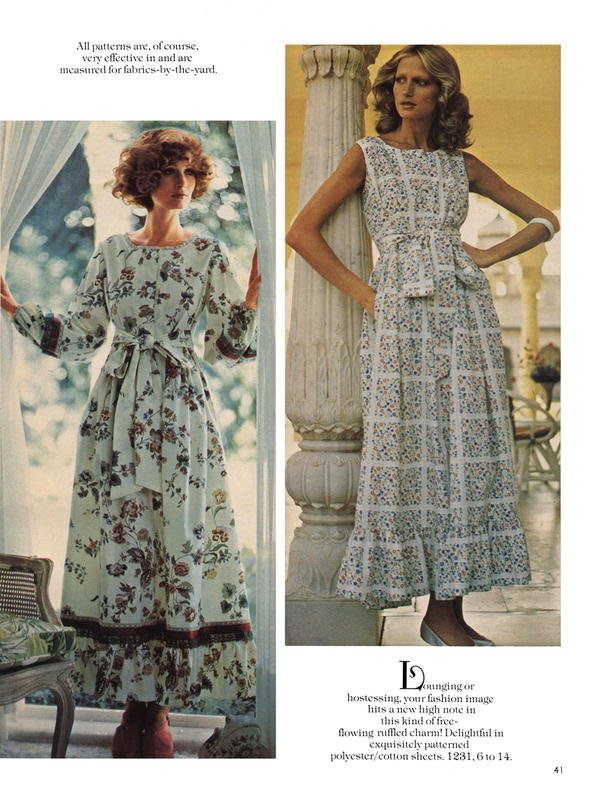 I was happy to do it, because my mother used to make us dresses from Vogue patterns, before she discovered the Frederick’s of Hollywood catalogue. 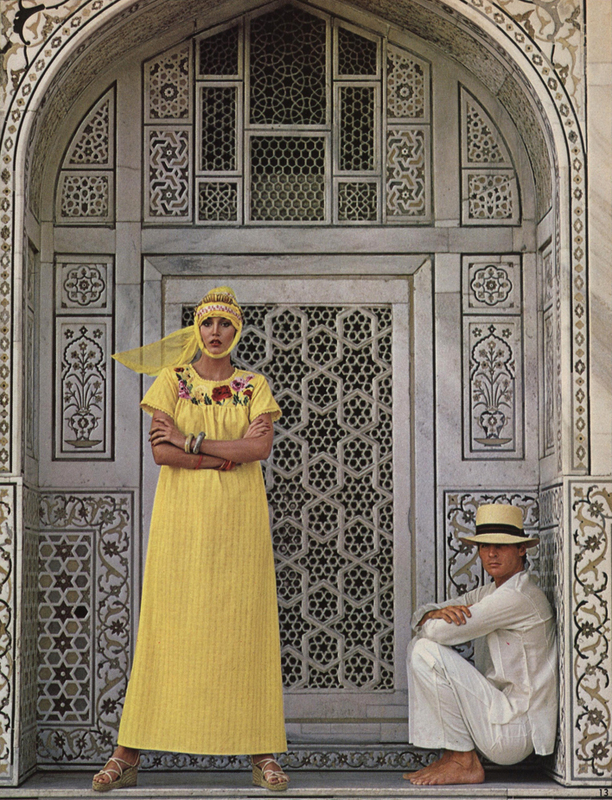 The dresses we took to India were very simple, which is why they put them in exotic locations, to make them look glamorous. For one shot, Steve made me climb up onto the edge of a building and hang on. 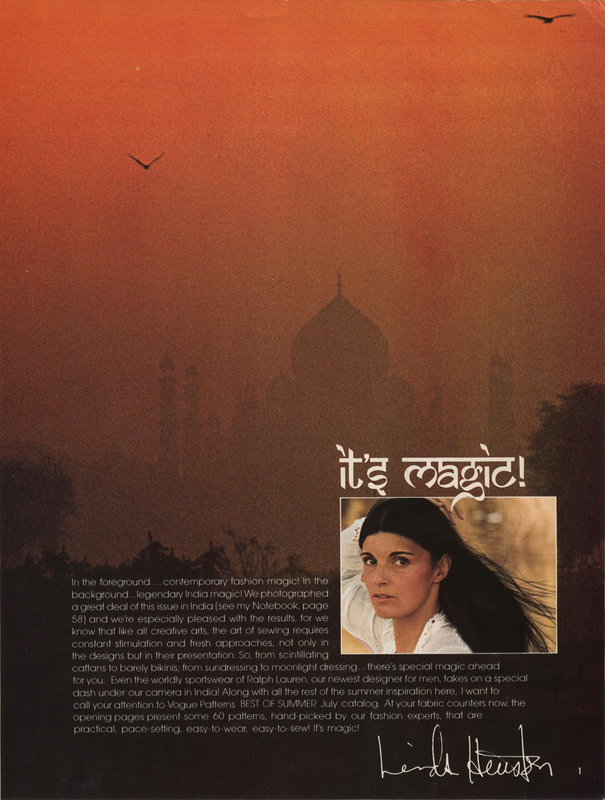 I really could have killed myself – we sometimes had to do crazy things while modelling. 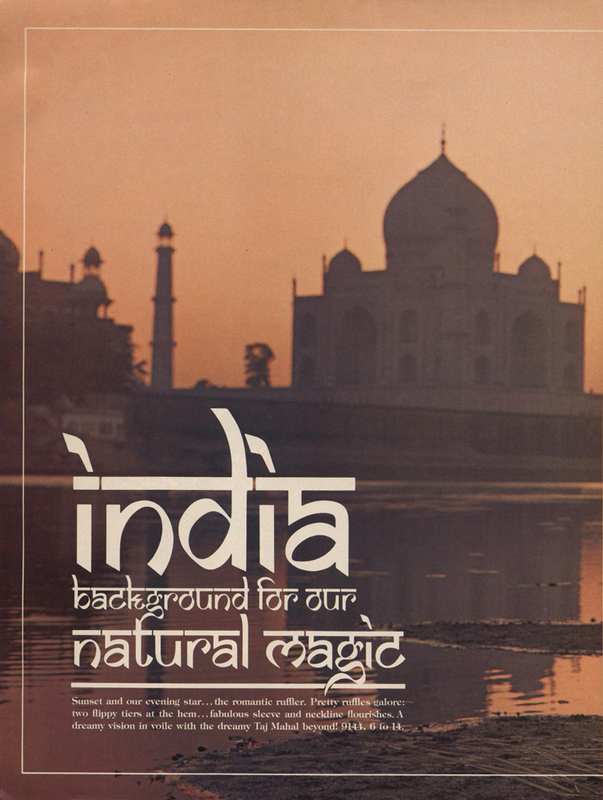 We travelled around India by train and I remember breakfast was made by a guy wearing what looked like a rag diaper, squatting down scrambling eggs over a little fire. Those Indian trains were pretty primitive. We took about 30 trunks of clothes and had porters to carry them around. Everywhere we went we saw examples of extreme poverty. I’d never seen anything like it and it was a shock. 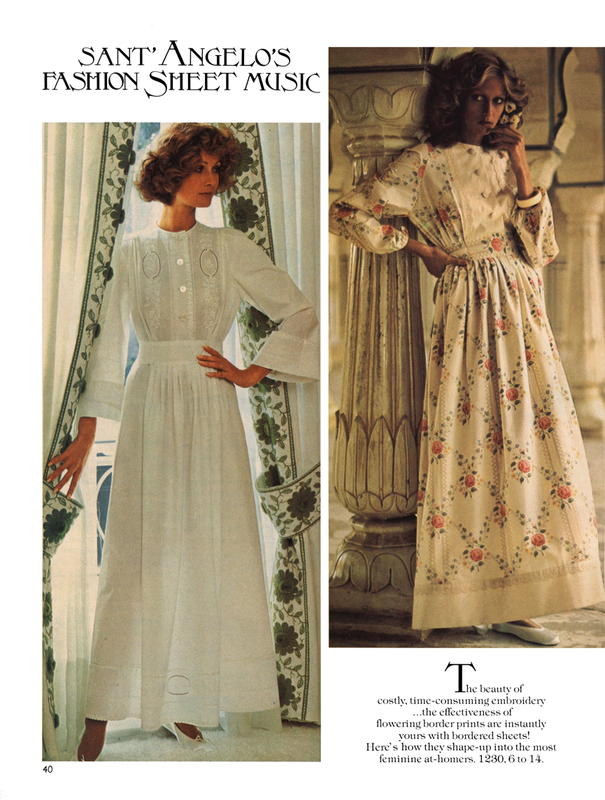 I guess that after a few years of modelling in Paris, naturally, Jerry couldn’t help but notice the difference between the dresses made from ‘Very easy, Very Vogue’ patterns and the Haute Couture and designer prêt-a-porter outfits she’d become familiar with. Such beautiful backgrounds. 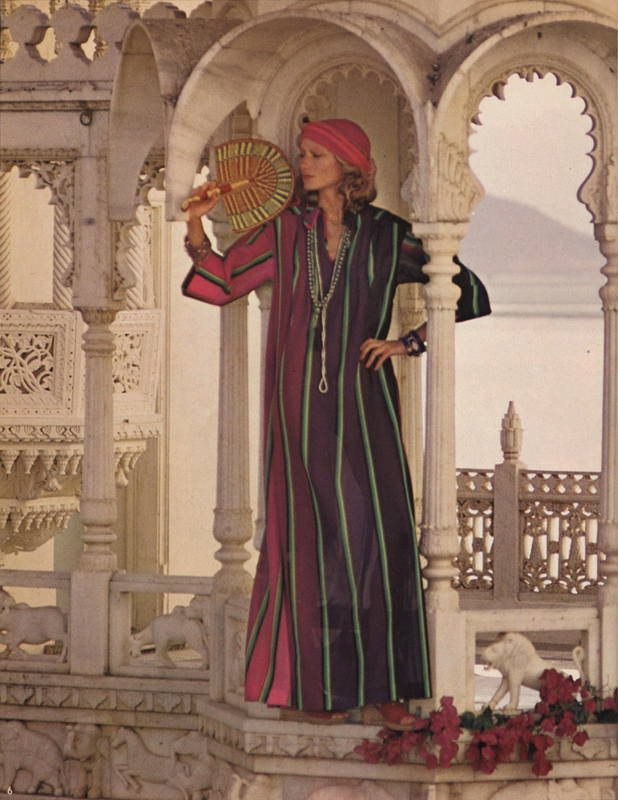 The turbans and accessories also help to create the ‘magic’ of the caftans. 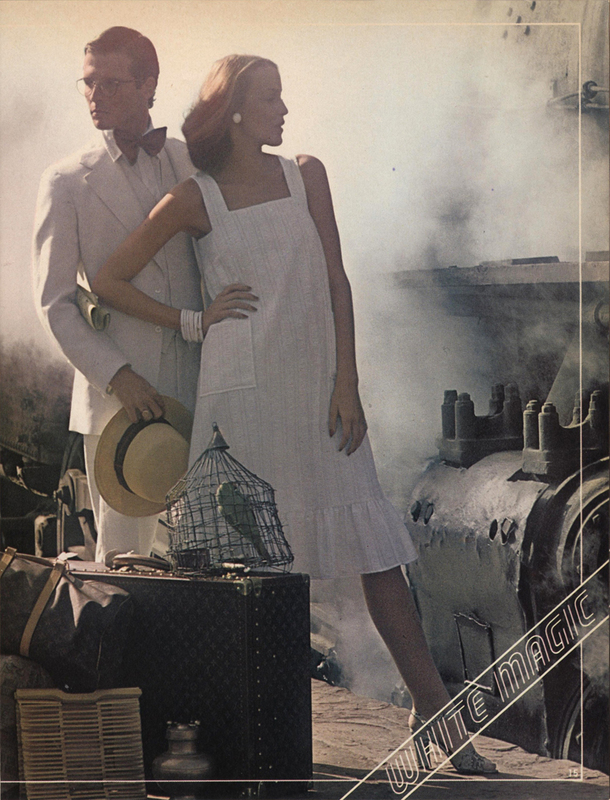 A romanticized and nostalgic take on train travel. 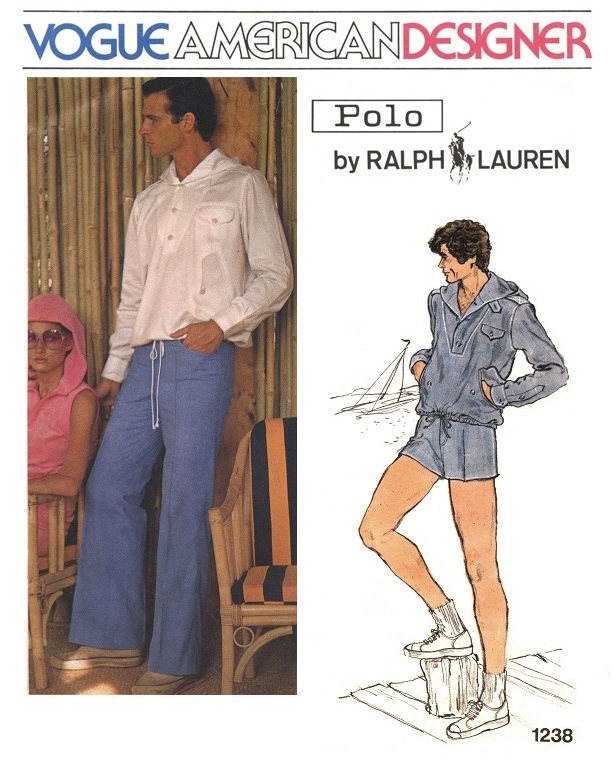 No rag-diapers in frame, of course. 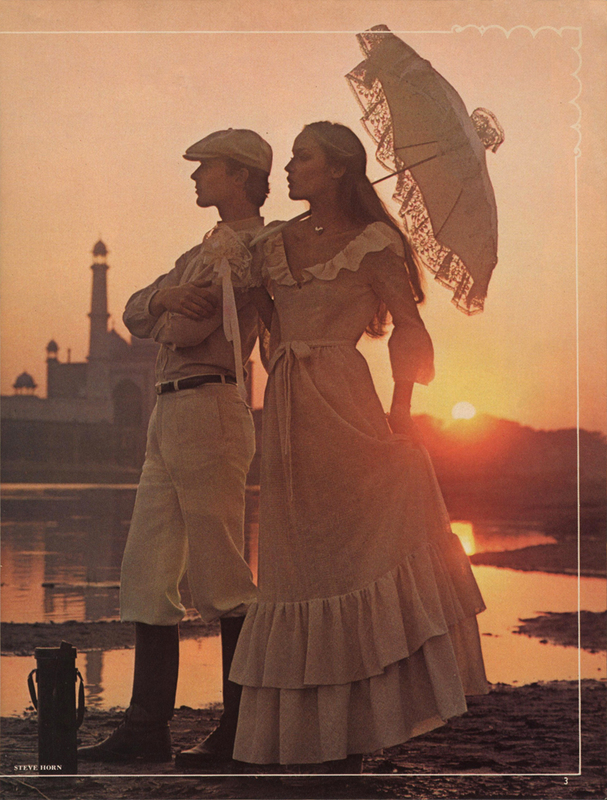 Evening ensembles with even more stunning background locations. 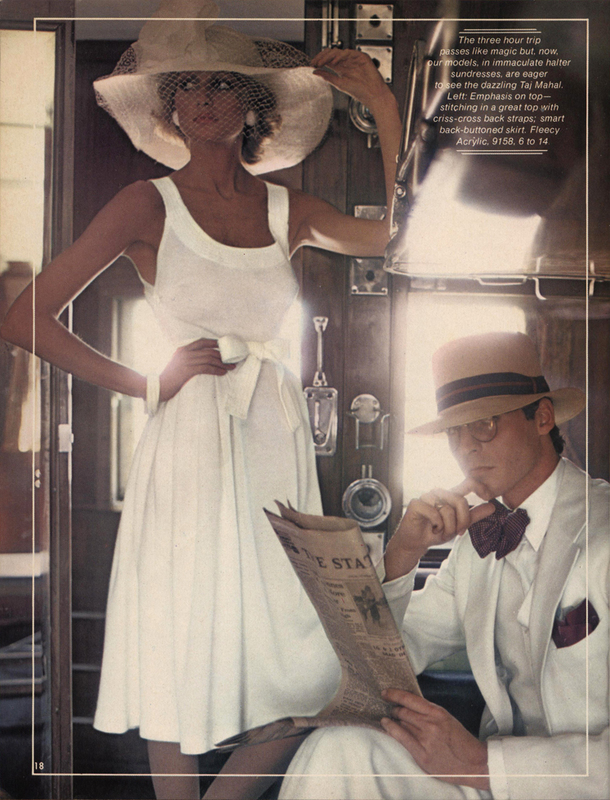 I wonder what Jerry thought about the one and only women’s designer pattern in the shoot, Vogue 1228 by Jerry Silverman (above, left). Probably just another dress, right? 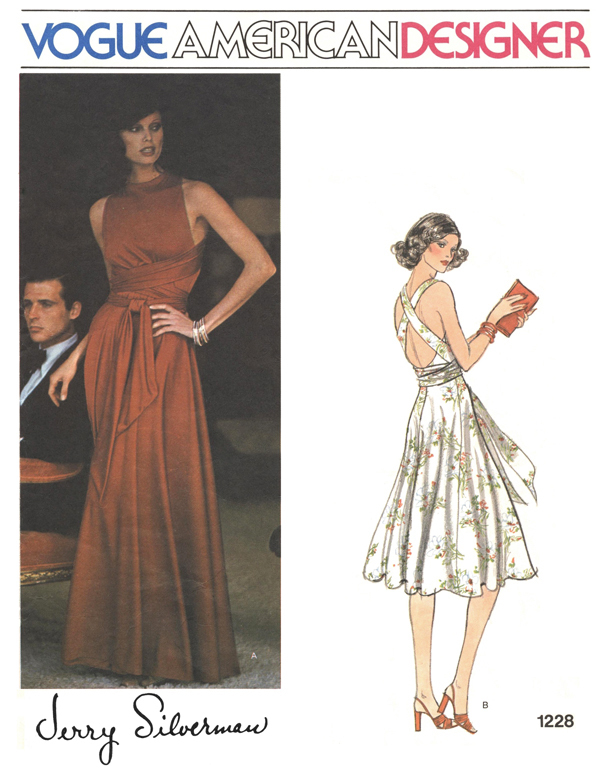 Anyhow, I’ve always liked that pattern, and the design is quite similar to a dress designed by Halston in 1972 (pictured below), except for a different front bodice, which came several years before the Jerry Silverman version. 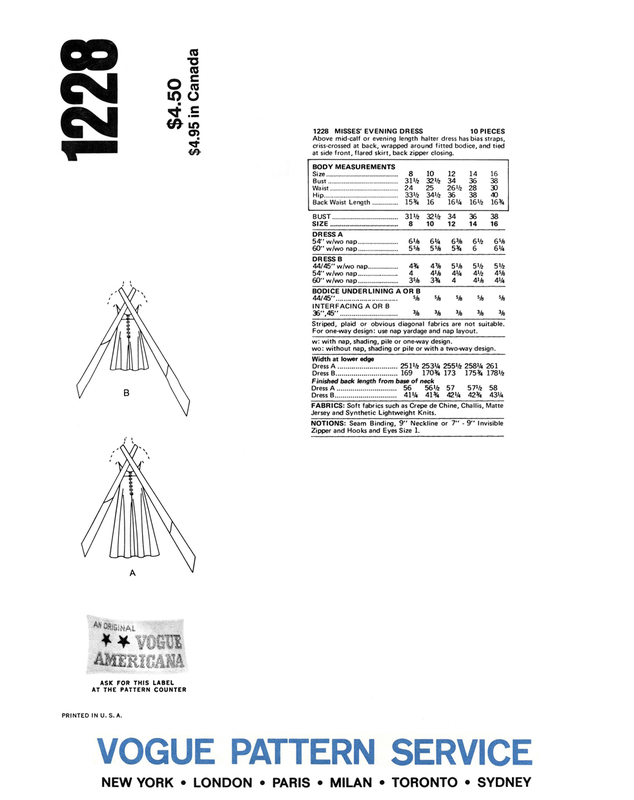 Vogue 1228 looks so good on the pattern envelope, and it’s likely to be the designer original that was photographed, which was usually, if not always, the case with designer patterns. 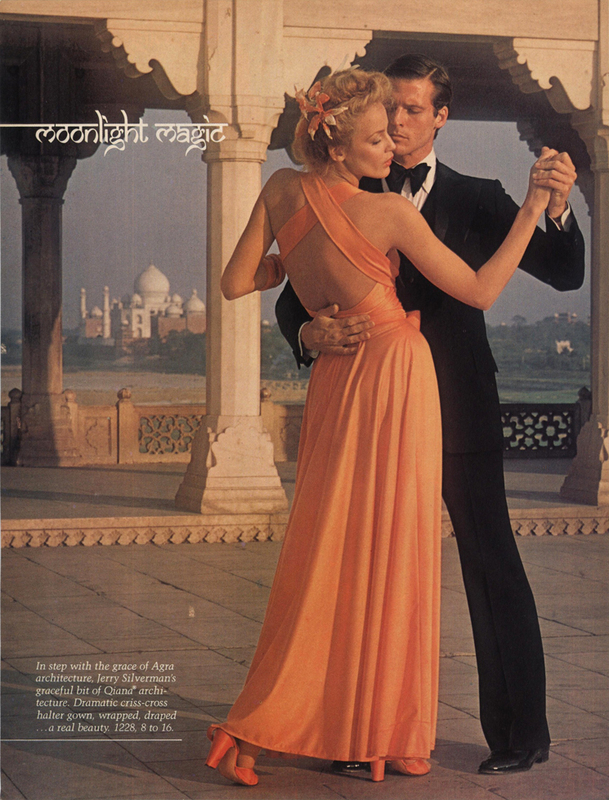 The orange version photographed in India was made up from Qiana, a synthetic nylon jersey, and I suspect that the designer original was also made from Qiana because of an advertisement I found in an issue of L’Officiel from 1978 for Qiana featuring a dress by Jerry Silverman (see below). 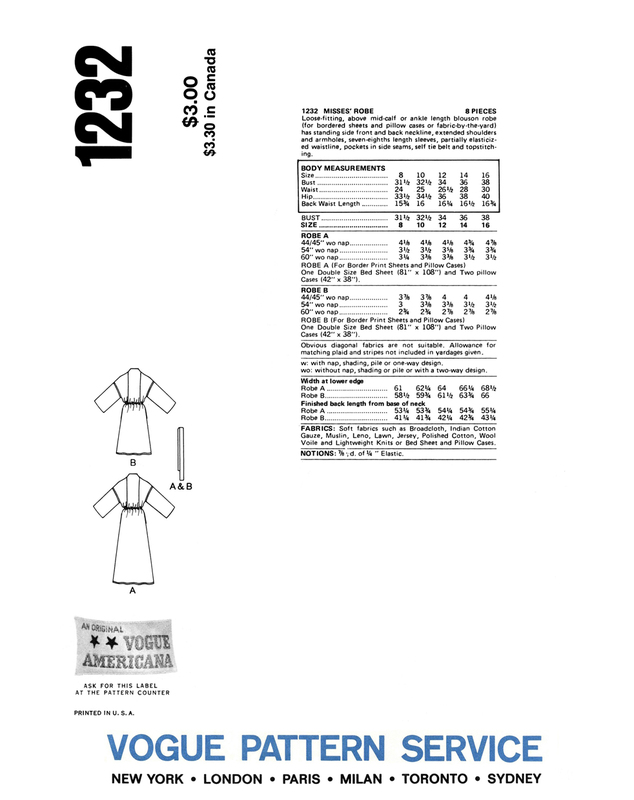 Also shown here is an ad from the same issue of Vogue Patterns magazine for Qiana with Vogue 1228 made-up from a soft pink color of the fabric. 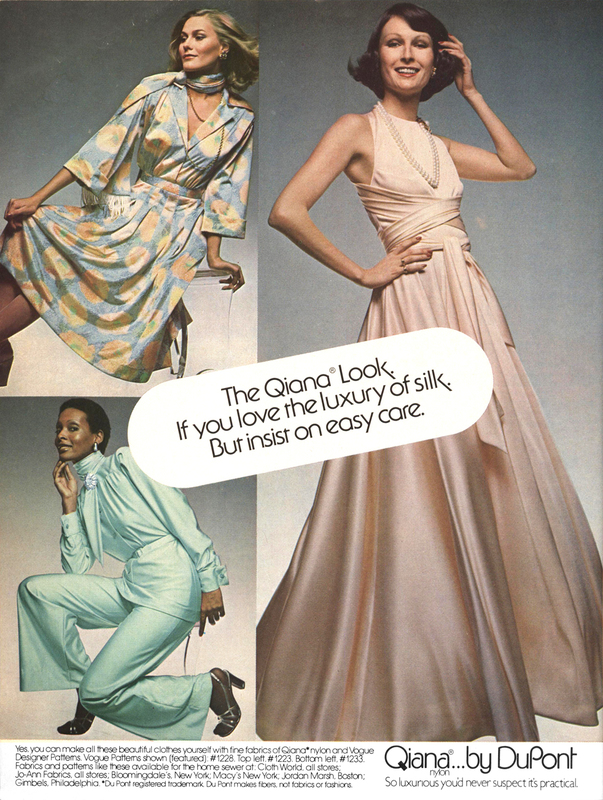 An advertisement for Qiana, featuring a dress made from Vogue 1228 by Jerry Silverman with the nylon knit fabric. 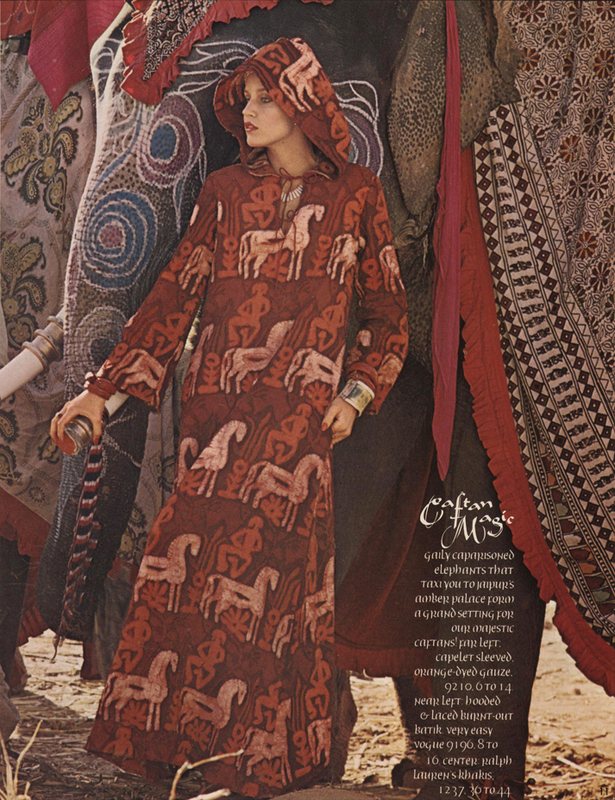 This ad was taken from the first few pages in the May/June 1975 issue of Vogue Patterns magazine. 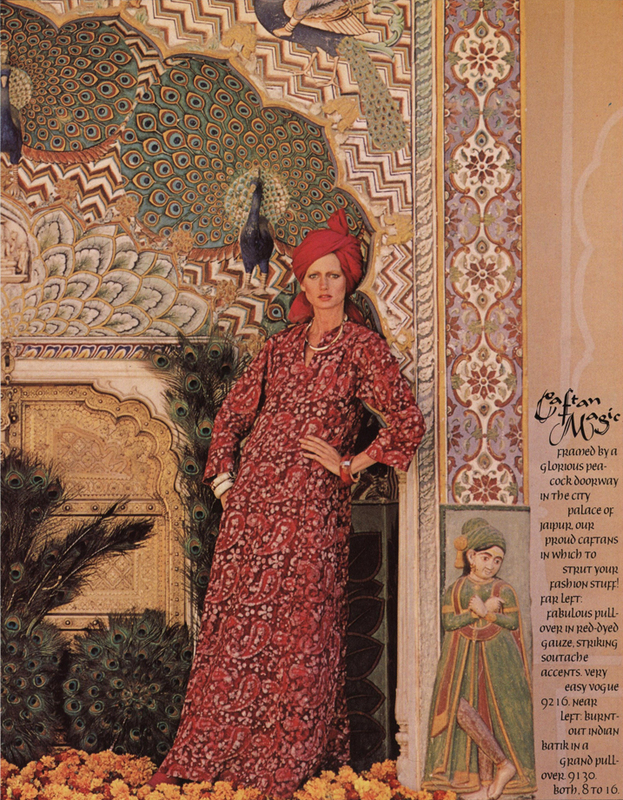 An ad for Qiana with a dress by Jerry Silverman made from the nylon knit fabric, taken from L’Officiel USA, Holiday 1978, Volume III, No 7. 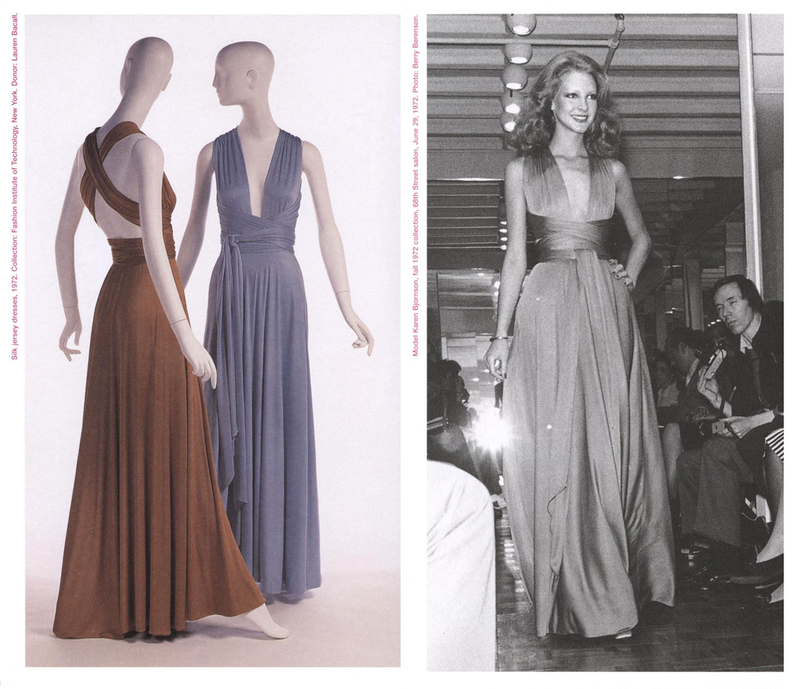 Halston’s design in silk jersey from 1972 preceeded the similar Jerry Silverman design by several years. 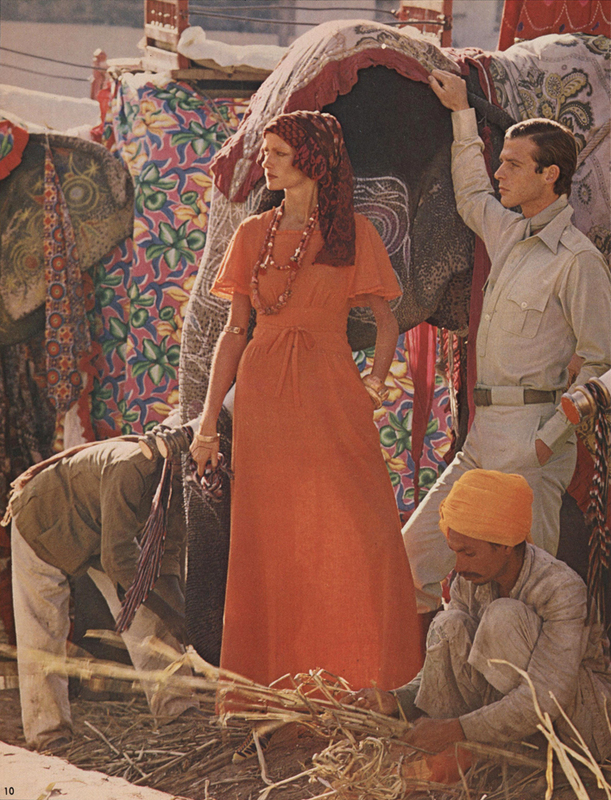 That’s Karen Bjornson modelling on the right (Images taken from the book ‘Halston’ by Steven Bluttal, first edition from 2001 by Phaidon Press Ltd). 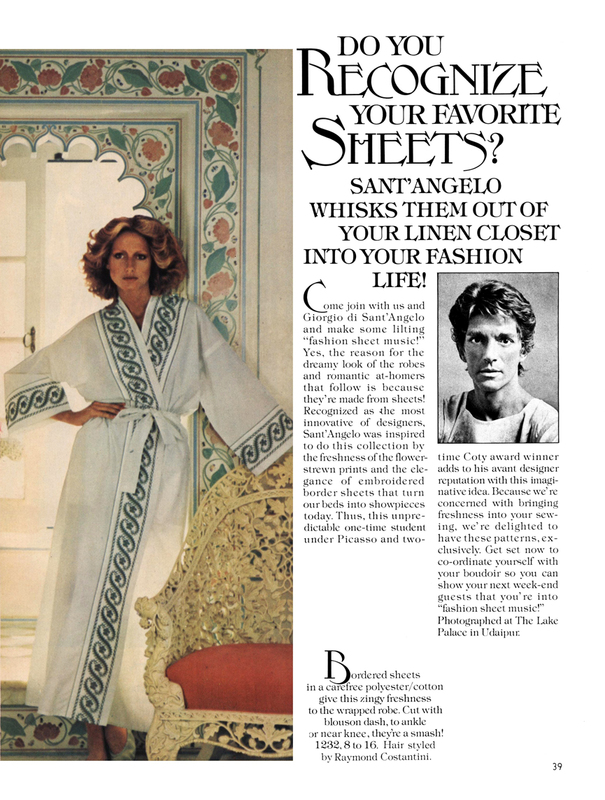 Below is the introduction of American designer Giorgio di Sant’Angelo to Vogue Patterns in Vogue Patterns magazine. 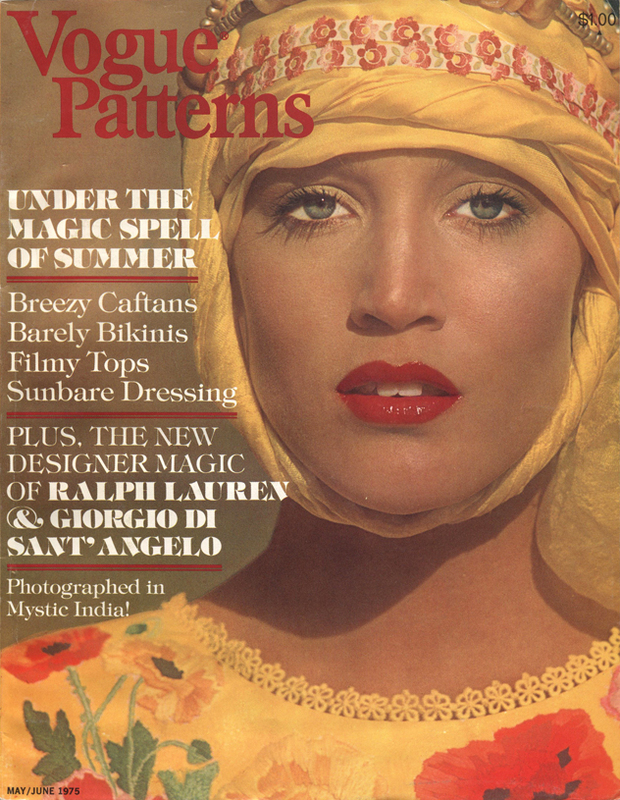 The Sant’Angelo spread didn’t feature Jerry Hall but the other model from the India shoot (does anyone know her name?). 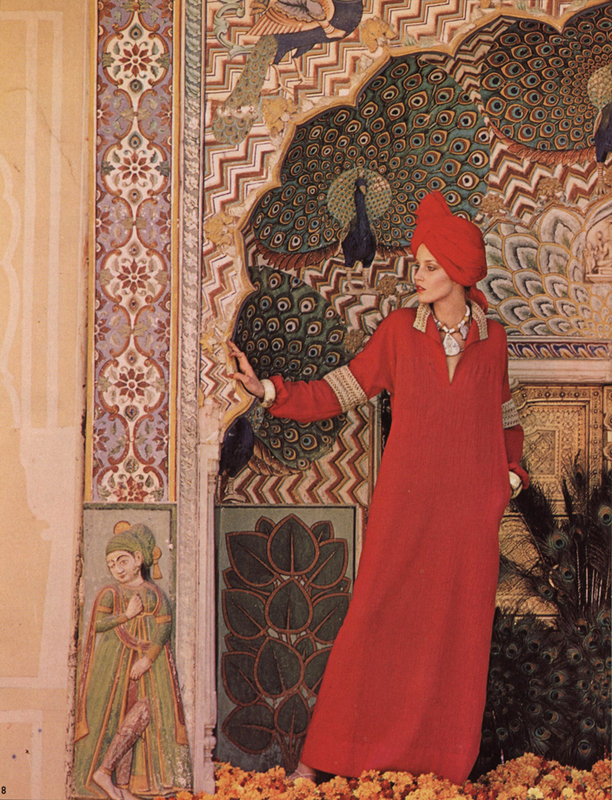 The robes and two of the dresses were evidently photofraphed on the India shoot, but the other two dresses were photographed elsewhere with a different model. I love how the prints on the robes tie so beautifully with the colourful tiling in the background! 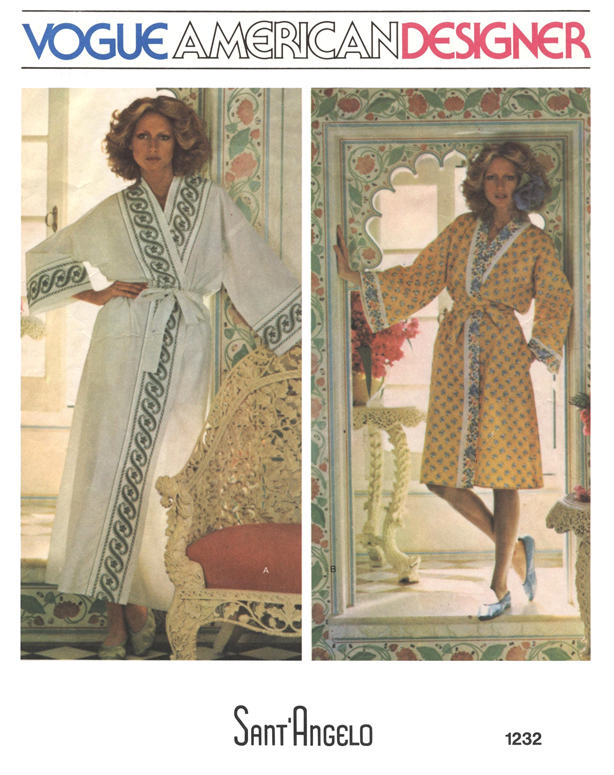 I have the pattern for the robe in my collection and I hope to make it up some day as a gift for a friend or relative. 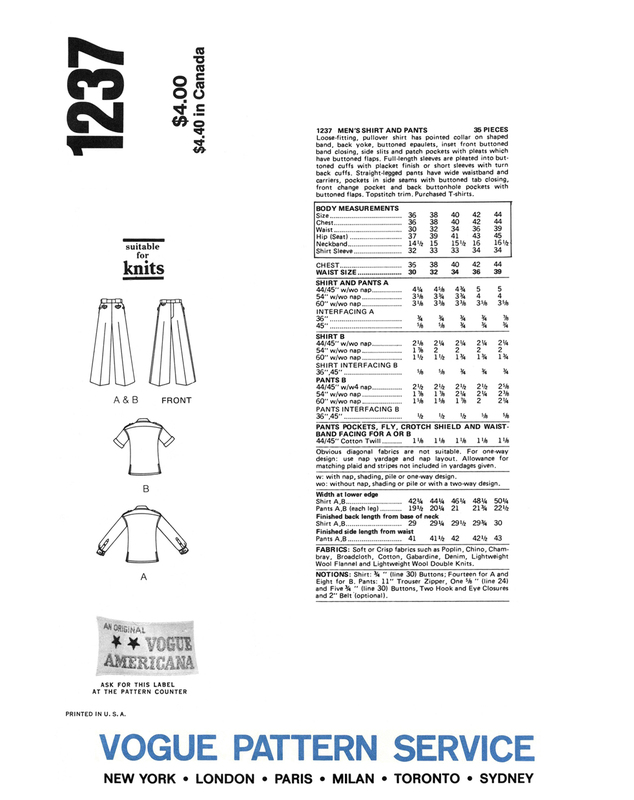 I’ve been on the lookout for suitable fabrics when out fabric shopping (which isn’t often) and I’ve been meaning to check-out the clearance bins at the local manchester shops for colourful and attractive flat-sheets to use, but I haven’t got round to it yet. 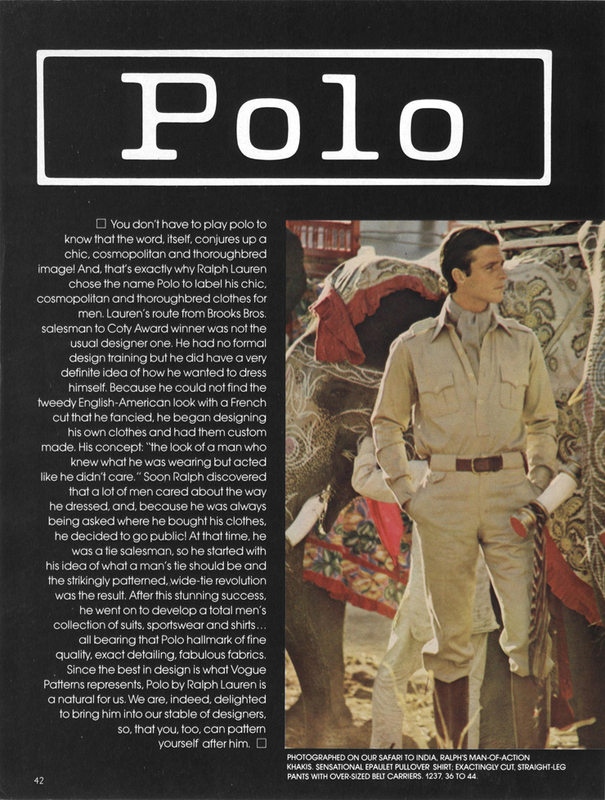 Here is another introduction of a designer in this issue of Vogue Patterns magazine, in this instance it is Polo Ralph Lauren for men! 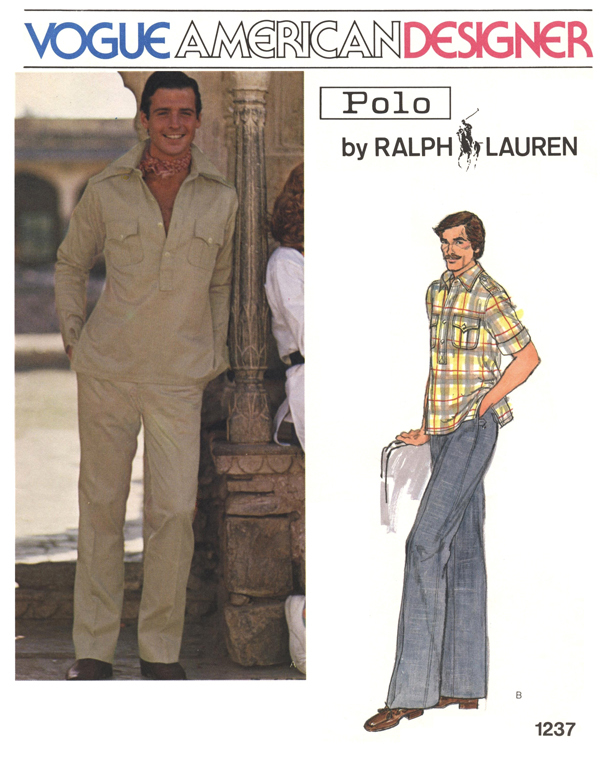 I get especially excited over designer patterns for men, as there weren’t that many ever produced compared to women’s. 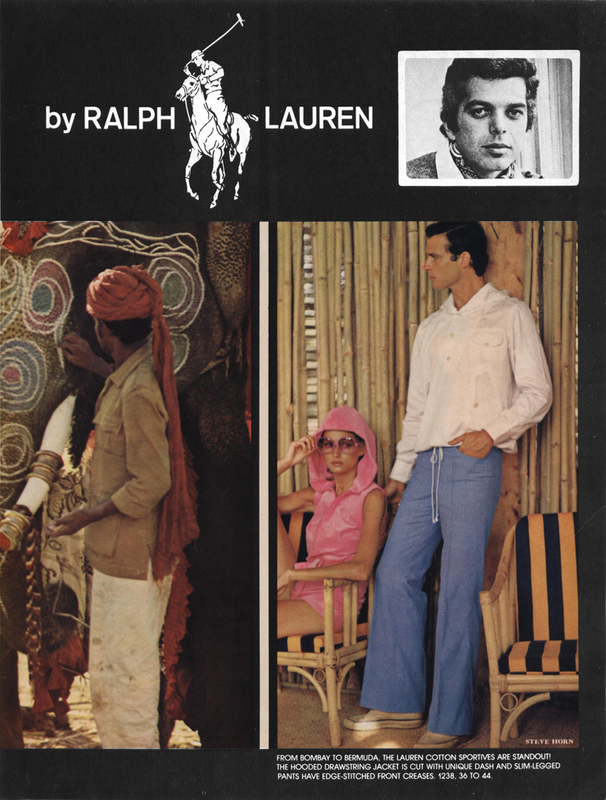 The seventies was the period when the most were produced, with designs by Bill Blass, Pierre Cardin, Givenchy, Dior, Saint Laurent, Valentino, Calvin Klein and Ralph Lauren. 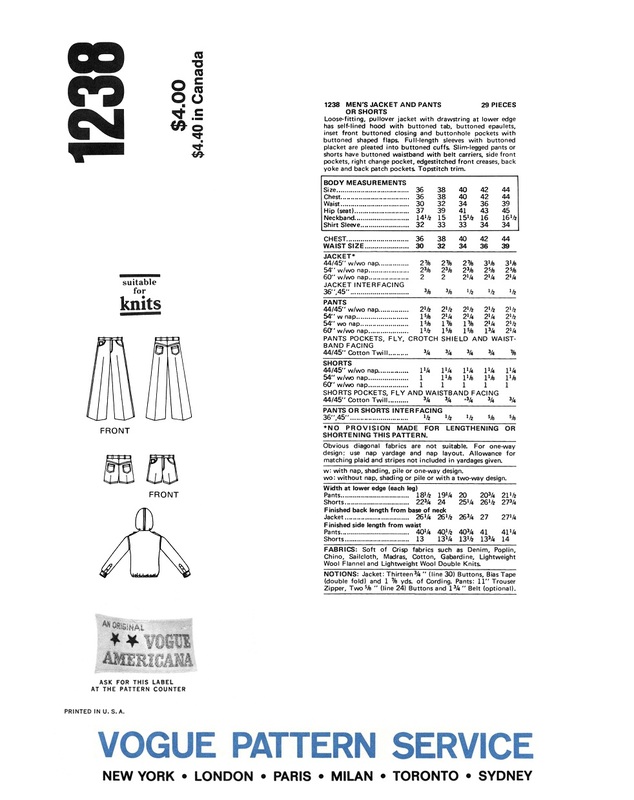 I like the oversized belt carriers on the pants of pattern 1237. 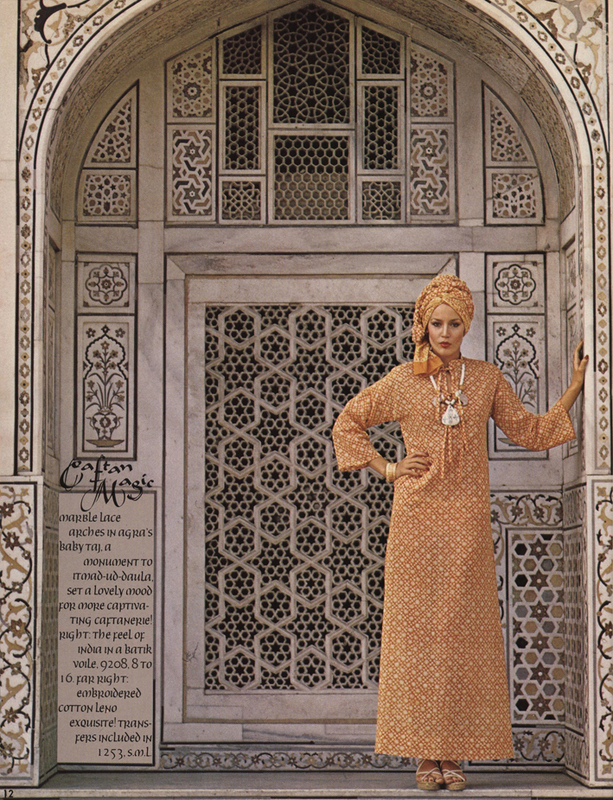 You can see another good view of the outfit for this pattern in the ‘Caftan Magic’ spread. 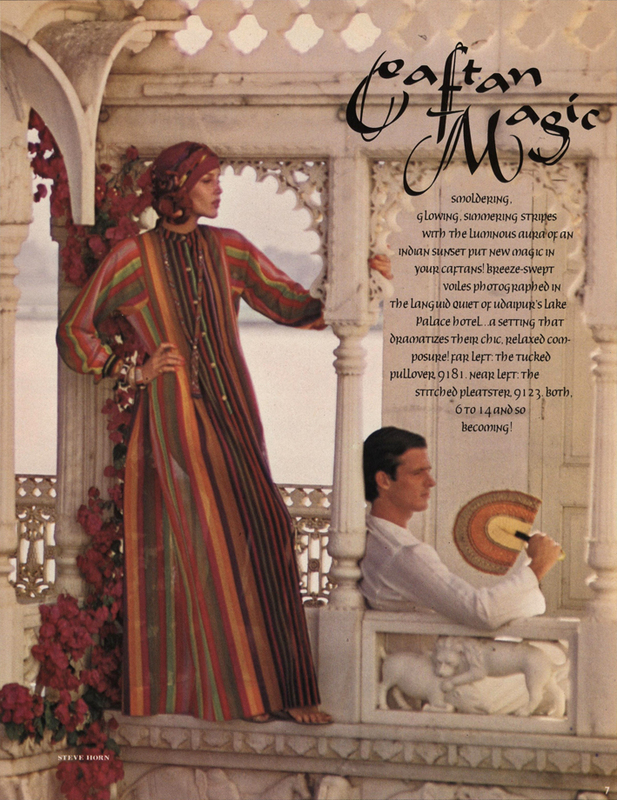 Anyhow, the India photo shoots make for a very special issue of Vogue Patterns magazine. 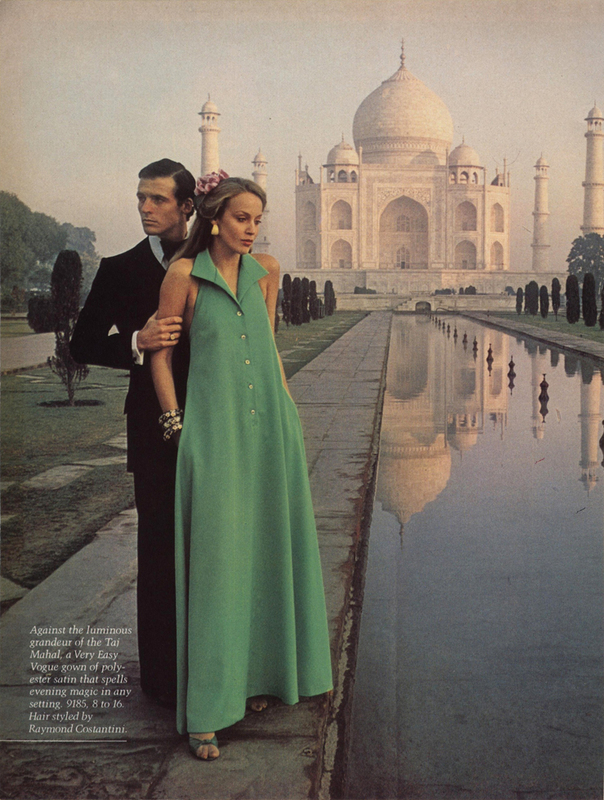 There are some stunning photos here, and I’m not sure that any other location shoots by Vogue Patterns ever topped it. 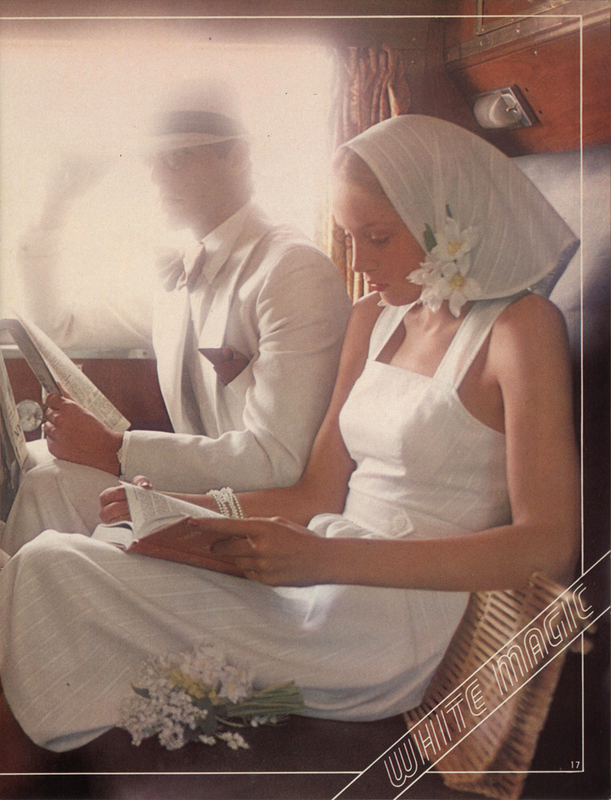 Below is the front dust jacket of the book ‘Jerry Hall – My Life In Pictures’ by Quadrille Publishing Ltd, 2010 (ISBN: 978 184400 880 3). I obtained my second-hand copy very cheap on abebooks.com. 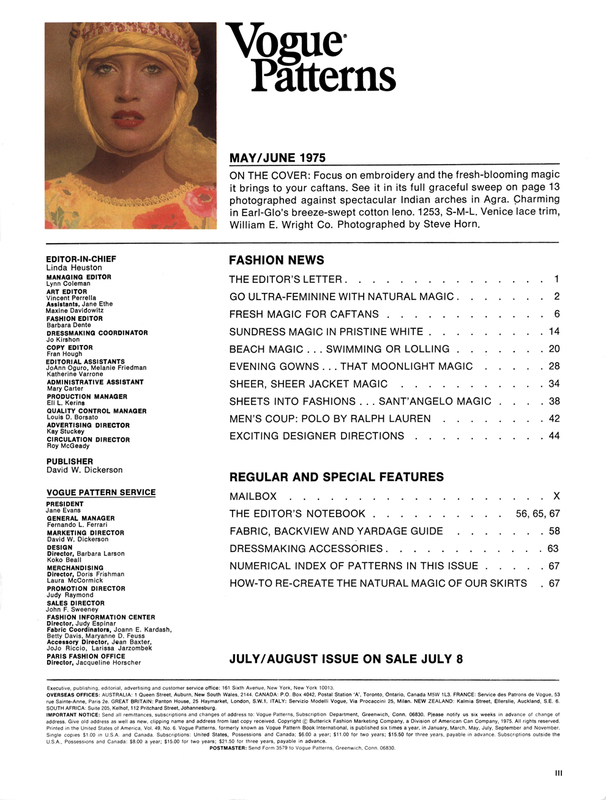 It’s a very entertaining read with MANY fabulous images and is a more up-to-date and slightly more detailed version of Jerry’s ‘Tall Tales’ from 1985, which is also in my library (I love Jerry! ).